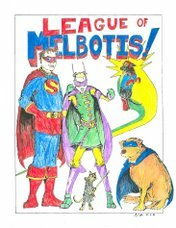 I know it doesn't really matter if I beg or plead with my good Leaguers... You're unlikely to pick up a comics just becasue I say so. The League is not made of stone, and every once in a while we're also particularly tired and/ or not feeling well. And in those moments, well, we confess a tear or two might creep to the edges of our otherwise manly, manly eye. -The death of Hippolyta in Wonder Woman. Poor, poor Diana. For the love of God, comic nerds, be good to your mother. You never know when an evil space tyrant is going to take her away. -We3. Pretty much every panel of every page of We3 had me sort of teary. It's partially due to something about how Frank Quitely draws, and partly because I'm a sucker for animal stories. -Lois's face when she sees Superman again at the end of New Frontier. Sometimes someone actually understands Lois and Superman, and Cooke knocked it out of the park. Sadly, the movie didn't really capture the moment in quite the same way. -Promethea. When Promethea turns to the reader and speaks to them in the penultimate issue of the series. This series was so underrated and under-appreciated in its time, its a crime. Moore truly succeeded with pushing the boundaries of reality on this one, and his collaboration with JH Williams is one of the finest examples of art and words mixing as they can only in comics that I've had the privilege to see. What Buddy Baker began with his "I can see you" business reaches a new apex. Also, maybe one day Jamie will let me hang my two Promethea prints. Amazing Spider-Man #36 - It's tough to imagine with a few years of separation, but in the wake of 9-11, Marvel Comics interrupted the storyline of the Spider-Man comics to tell a story devoid of cynicism, and which captured some small aspect of the tragedy of 9-11. And just as it uses the eyes of Spider-Man to capture the helplessness of the day, we also see the determination of the real heroes of 9-11 reflected in the story. Had this story been printed now, it would seem odd, manipulative, and in questionable taste to use the very real tragedy of 9-11 as a backdrop for a tale of the wall-crawler. But at the time... And even today as the tragedy of 9-11 fades from view with the passage of time, it will be a time capsule of how we reacted in the days, weeks and months following. No doubt some readers will feel it absurd, even insulting that Marvel would have dared to tell a Spider-Man story, but that is now. This was then. There are also stories of how quickly this comic was produced, hitting the shelves by November, 2001. Indeed, you can feel the urgency of the story, and the raw feelings of a true moment in history and how Marvel tried to come to grips with what was the only thing on everyone's mind. Laika - Is there anything more likely to make you cry than shooting a puppy into space with no plans to bring it back? Reall, you could probably get my lower lip trembling just asking me to tell you what our Russian friends did to get something alive into space before the US of A. This is, also, a great comic. I highly recommend. First in Space - America's inability to treat its own non-human astronauts with John Glen-like-respect gets its own treatment in this true story of the US's first chimp in space, Ham. Suffice it to say, The League's feelings regarding poor treatment of chimps, especially when its a true story, are perhaps stronger than we care to admit. All-Star Superman #10 managed to fall somewhere in there. And for Superman fans, Morrison and All-Star Superman have been nothing less than a gift. Each panel reflects more understanding of who Superman is and what that should mean rather than the mere caped do-gooder too many writers have fallen back on. The essence of what fans find in the character is omnipresent in each of Quitely's perfectly composed pages. As with We3, and parts of new X-Men, Morrison and Quitely seem to have a synergy few other writer/ artist teams seem able to capture. Quitely manages to convey the quiet magic of Superman's world in a manner that seems to have been lost since the days of Curt Swan, with broad expanses necessary to contain the Man of Steel. His renderings of each character's expressions rival Kevin MacGuire for internal monologue. The ideas and understanding of what a Superman would mean to the world, and what responsibilities that Superman would feel pervade the issue. But to tell it is to give the moments away. Perhaps when the series is completed and collected, I can recommend the trade collection. In the meantime, you're missing out on one of the best comics on the stands. 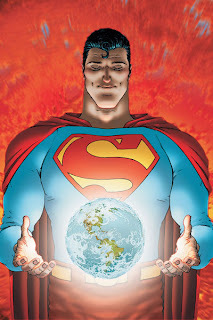 If we get a little misty when reading All-Star Superman, we hope you'll forgive us. The same thing happens whenever I watch Superman and they do that pan over the Kryptonian landscape. The League doesn't mind shedding a few tears now and then. We're sensitive like that. As much as I love getting a good laugh out of a Jimmy Olsen comic, every once in a while, its nice to know comics can be a powerful enough medium to involve us enough in the characters, in their worlds, to maybe do a bit more than tell another tale of fisticuffs and heat vision. Your comments about the post 9-11 issue of Spiderman got me thinking back to the events of 9-11 and how profoundly the entire country was effected by that tradgedy. It really was an event that had an actually genuinely emotional resonance for just about the entire country in a way that I wouldn't have believed possible had I not lived through it (it must have been similar to the feeling that the country had after the attack on Pearl Harbor- other from that I can't draw many parallels). I'm not sure that subsequent generations will understand the impact of that event or the nation's reaction to it (more specifically, the emotional impact that the attack had upon people all across the country, despite the fact that we didn't know the victims, personally) unless they live through some similar event of their own. I remember the late night talk show hosts coming back on the air after taking some days off following the tradgedy, and almost without exception, each of them was choked up and had difficulty putting on their shows. I would have felt the whole thing melodramatic, staged, and probably exploitative if I weren't going through the same emotions myself, at the time. It's good that there's a comic out there that reflects the emotional climate of the nation at that time, even if it's hard for later readers to get their heads around. I can honestly say that I'm loving All Star Superman. It is totally amazing! This is high praise coming from someone who tried but never enjoyed Superman comics. I could never get past the fact that he was totally invulnerable. There was never any sense of danger when I was reading a Superman comic. Laika was probably the most depressing book I've ever (mostly) read. So much so that I couldn't even finish it! That comment was by Jamie. Waiting for the TPB's on ASSM, but just wanted to chime in and say that We3 is one of the jerkiest tearjerkers that ever jerked, and Quiltey's art is part of it, but the poignant "animal speak" really hit me in the gut. I think you sort of answered your own question regarding the "why" of Laika. Was the use of animal necessary? Or maybe the simple tragedy of Laika's only home and care ending in glory for the USSR that she never could have understood, just part of the exploitative system of the Soviet Union. Did we do any better? I find it interesting that two artists worked on "Laika" and "First in Space" simultaneously, and both were released within a calendar year. Sometimes things are so terribly sad and ultimately unrewarding, it is hard to understand the "point" of the story, because the act seems so pointless. I am not sure that means the story is not worth telling, if only as a cautionary tale. In this case, as you mention, the cost of progress. Especially to the innocent. Also, I'd point to We3 as a kindred spirit of a story to both "Laika" and "First in Space", but from a fictional perspective. Pretty much any time Superman swoops in and rescues a child just in time (this also works for the Flash) I get a little teary eyed. Lots of heroes save kids, but there's something about doing it in hyper-time, the idea that it is already too late, no normal human agent will prevent the tragedy. But in the tick of a second hand, Supes or Flash scoops up little Johnny who's about to be impailed by a villian's index claw. There's a Joe Kelly storyline in JLA, "Trial by Fire", that has the best Flash moment of the sort you've described that I've ever seen. if you can find the collection, you'll be able to find the moment. I shall most definatly look for it. It's okay to cry when men in tights are involved. Or is this the best video ever?